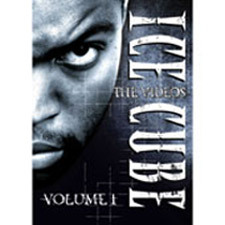 10 years is a long time in hip hop and it shows on Ice Cube's "The Videos Volume 1" which is taken from 1990-1994. Exactly when did hip hop become such an homogenized genre of music which produces international superstars Nelly's and Eminem while artists who keep it real like Dead Prez and Non Phixion are left floundering. While back in the day there were always people like Vanilla Ice and MC Hammer (who at the very least have got to be given credit for taking hip hop to the masses), there were always people like Ice Cube and Ice T and a whole range of artists who were distinctive and individual in their outlook. You would turn on MTV or watch music video's and it wouldn't just be the clichéd chilling by the pool with the ladies, at the same time as the braggadocios attitude of hip hop it also allowed for a glimpse into the reality of the gangster lifestyle rather than a glamorous sepia tinged view of it. "Who's The Mack?" sees Ice Cube looking at the macks( pimps, the beggars) before claiming that he's just a real n.i.g.g.a unlike those Iceberg Slim. It's fresh and innovative without having the feeling that millions have been spent on the videos. The bling bling attitude of the ghetto is one things that's always surprised me - how these guys can go from having nothing to spending millions on a video - when people like Ice Cube can come in and do video's that hold your attention at a fraction of the price. "Jackin For The Beats" is more familiar gang warfare territory but it's always gritty and real showing the life that people in the ghetto live in rather than a guy in flexing his muscle and jewellery in a BMW. Ice's "It Was A Good Day" is his instantly recognizable hit and hip hop classic and shows exactly why hip hop was so much better in the day. Each of these video's are distinctive, as is the music itself, and the one thing that holds it all together is Ice's unique vocals and image. Ice Cube The Video's should be a viewing requirement of any hip hop act signing a deal nowadays. When you consider that hip hop once had Public Enemy, Ice T, Ice Cube and Run DMC as it's figureheads you have to wonder why people are content with the latest Dr Dre production line commercially viable crap. While there is no doubting his skill as a produced you have to consider that Eminem's been releasing the same record for the past 3 years. On the other hand we have an artist here who over the space of these 4 years alone changed and developed with each successive release. Any self respecting hip hop fans should own this DVD.